Home to the best beer in the world…probably. While the Ailsa Course, the promise of 5* star luxury at every turn and world class dining are certainly reasons to make Turnberry the destination of choice for your next Scottish Golf Break, we all know post golf drinks are the staple of any good golfing getaway! Just as well then that the house beer at Turnberry causes a real stir among visitors tasting it for the very first time. St Mungo Beer, brewed by the WEST Brewery which is based at the Templeton Building on Glasgow Green, not too far from Turnberry itself, was installed as the house beer at the resort in the lead up to the 2009 Open Championship. It has been a hit with visiting golfers ever since. 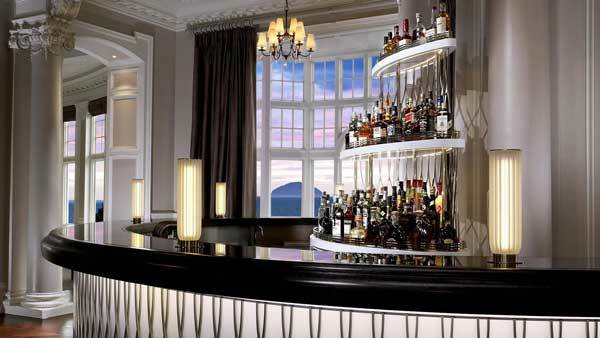 There are few better places to enjoy a well deserved pint of St Mungo than Turnberry. Once your pint is poured, sip it on the balcony overlooking the pitch and putt course while gazing out towards the Ailsa Craig. We happen to agree…another pint please barman! 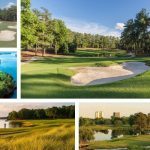 There are more than two golf courses! 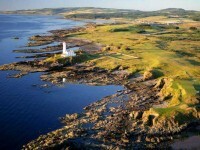 Set against the backdrop of the iconic Turnberry Lighthouse, the Arran Course is the ideal place to get to grips with some of the challenges put forth by links golf, what with its undulating greens, tight tee shots, pot bunkers and thick rough, all of which are characteristic of the Ailsa and Kintyre courses. In the evening when all is said and done, why not sharpen your short game, or indeed settle a few scores on pitch and putt course which sits in the shadow of the magnificent Turnberry Hotel? And there’s a pitch and put too! You’ll probably notice this on your way to check into the hotel but at the foot of the hill up to the hotel lobby lies a fun little 12 hole pitch and putt course. 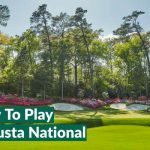 Hotel guests can play for free with clubs and balls available though the concierge and during tournaments such as the Open, don’t be surprised to see golfing stars having a crack with their wives and children. 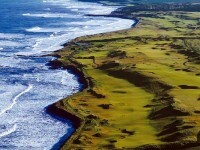 Turnberry was destroyed and rebuilt…twice! Due to Turnberry’s “strategic” coastal location, the flat links land on which the courses now reside was not once, but twice coveted real estate as far as the military were concerned. During both World Wars, Turnberry’s golf courses were levelled to make way for airstrips, hangers and huts, with the hotel being commissioned as a hospital. With the help of famous names such as James Braid, who worked on the restoration following World War I, golf returned to Turnberry and has since been making its own history of the sporting kind. While the tournament most readily associated with Turnberry is of course the Open Championship, it was actually the John Player Classic of 1972 which thrust Turnberry into the spotlight. 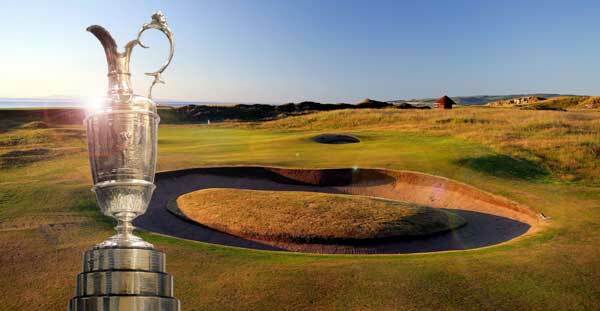 The event attracted a field of the world’s most high profile players including the likes of Arnold Palmer, Gary Player and Tony Jacklin and proved to the powers that be that Turnberry could indeed handle the influx of people associated with the hosting of a major championship. When the R&A eventually awarded Turnberry with the Open, it was still seen as somewhat of a risk due to concerns over accommodation and infrastructure, but the Open Championships that have followed – there have been four in total – include some of the most memorable scenes in golf’s history. Who could forget the legendary 1977 Duel in the Sun between Jack Nicklaus and Tom Watson or of course Watson’s heroics at the age of 59 during the 2009 championship? We have the John Player Classic to thank for those! Donald Trump – Changes afoot? Anyone with a keen eye on the world of golf can’t have failed to recognise Donald Trump’s ever expanding golf empire over recent years and the American tycoon added Turnberry to his portfolio earlier this year. 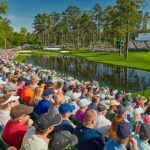 Some of the potential changes, as outlined in a recent Golf Digest Q&A with Trump himself, include re-routing holes 9, 10 and 11 – already the most iconic on the course – but, rather reassuringly, Trump has always been very careful to point out that any changes made would be very carefully considered and only carried out under the strict approval of the R&A. 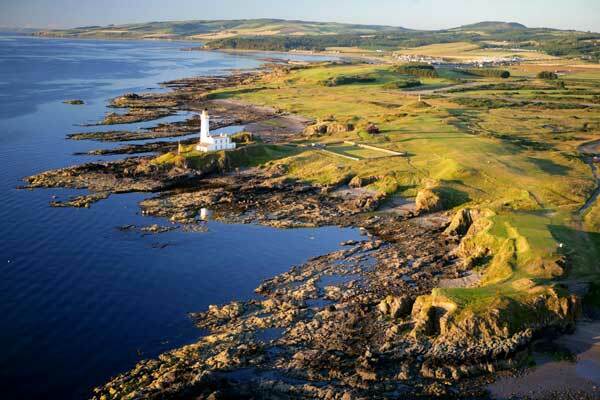 The Golf Digest Q&A revealed that, while nothing is set in stone yet, the ninth could become a par 3 over the water, with the green sitting in the shadow of the iconic Turnberry Lighthouse. “It could be the greatest par 3 in all of golf,” says Trump. The clubhouse could also become a halfway house, which would certainly be spectacular. The 10th green could be relocated closer to the shore, making for a dramatic par 5 that doglegs its way around the coastline and the 11th could be transformed into a stunning par 3 which will play over the rocks and the sea. Whatever happens on the Ailsa Course over the next couple of years, those with a soft spot for the course will surely have a close eye on proceedings!